Sparked by a post on Reddit shortly after posting my MSFCalc for raid lane assignment, I’ve built a PowerShell based Team Builder for Marvel’s Strike Force. The team builder will let you assign 5 heroes, based on each ‘stat’ category, will NOT let you use a hero in more than one category, shows you how many ‘positives’ there are for each hero selected, how many for each ‘stat’, and gives you the total count for the team. You are also able to save / export teams and import previously saved teams. As noted by a user, depending on the restrictions for running scripts on your computer, you may need to run PowerShell as Admin to run the command ‘Set-ExecutionPolicy -ExecutionPolicy Bypass’ to enable scripts to run (instead of Bypass, you may need to use Unrestricted). This script itself does not need Admin rights. Note: As this is PowerShell, you’re free to modify and distribute as you wish, but please do give proper credit to me for this original work. 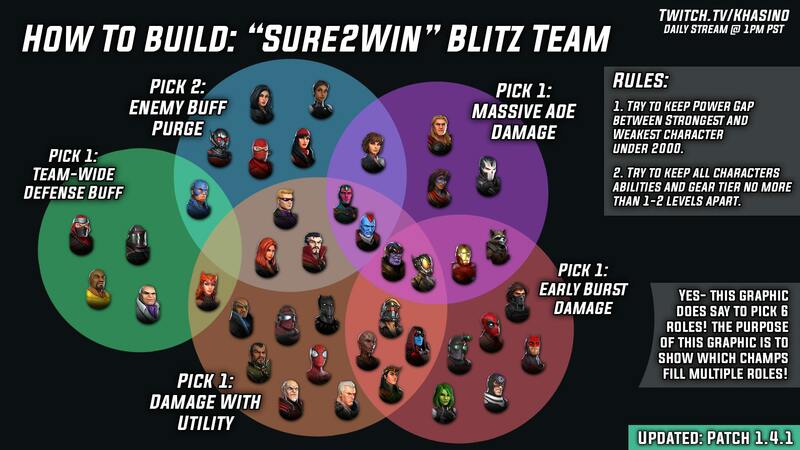 $row1.STAT = "Team Wide Defense Buff"
$row2.STAT = "Enemy Buff Purge"
$row3.STAT = "Massive AOE Damage"
$row4.STAT = "Damage with Utility"
$row5.STAT = "Early Burst Damage"
$row7.STAT = "Hero Tier: 1 (Trash) to 5 (God)"
$POSHGUI_lbl_SureToWin.Text = "Team Is Sure To Win!!! (Probably)"
This calculator for Marvel’s Strike Force mobile based game is for determining Raid Lane assignment for Alliance members. There are options to assign by Strongest Team Power (STP), Total Collection Power(TCP), or Randomly. You just plug in your player’s information, edit the lane difficulty for the desired raids (you can add and delete raids), then select your assignment scheme, and calculate the assignments. It’s just that easy! If you have any questions, comments or suggestions, do leave them below. The script does not require admin rights, nor does it perform any web calls. Download below or copy/paste from the code below into a text file and save as MSFcalc.ps1. Right-click the file and select Run With PowerShell. 1.5 – Removed additional lane assignment. Fixed lane assignments where lane difficulty is 0 (unused), the lane is not used for assignment. Added ‘Support’ lanes for overflow players beyond the assigned lanes with specified difficulties. 1.4 – Added an additional lane for larger raids. 1.3 – Added a lane format selection to change between Letters and Numbers. This is only applicable to the Raid Lane Assignment Output and not the Raid / Lane difficulty setup so as to maintain backwards compatibility for previous versions. A=1, B=2, C=3 etc. $POSHGUI_cmb_raidSelect.Text="EDIT Raids & Lanes, or Choose A Raid To Assign"
$POSHGUI_lbl_laneDifficulty.Text="Define Lane Difficulty (1 = Easiest, 9 = Hardest, 0 = Lane Unused)"
Write-Warning "Launching into a regular powershell console window"
Write-Host "Calculating Assignments using $Scheme"